The biggest difference between faucets in a showroom and faucets in daily household use comes down to one simple word: Shine. While most sink faucets start shiny and beautiful, over time they tend to grow dull and dirty. People are constantly washing their hands, soap is splashing onto the faucet head, and stains and water spots accumulate, taking away the faucet’s original luster. Has this happened to your bathtub/shower faucet or your sink faucet? 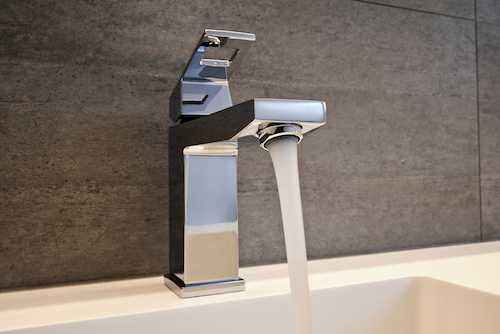 Have you noticed a general dinginess around the faucets in your bathroom space? If so, here’s what you need to know about bathroom faucets and how to keep them looking like new. A clean faucet is a shining, streak-free faucet. When you notice an accumulation of spots and stains building on your bathroom faucet, you know it’s time to do something. This is true whether your faucet is made of glass, porcelain, chrome, brass or another material. Like-new feeling. It’s as true of faucets as it is of automobiles — the better their condition, the newer and more valuable they look. Overall sense of cleanliness. Creating a clean bathroom feel requires every component to be tidy, from the countertops to the sink faucet. Water spots on the faucet won’t work. More of a wow factor. In terms of creating a strong first impression to guests and visitors, a sparkling faucet goes a long way. Keeping it clean and polished turns it into more of a showpiece. Pull from the liquor cabinet. Believe it or not, vodka can be a great cleaning tool, at least when it comes to bathroom faucets. Soak a cleaning cloth in the alcohol and use it to polish glass, porcelain or chrome fixtures. Try an acidic medium on soap spots. Basic white vinegar can be effective at removing soap scum and water spots. Similarly, lemon juice can help get rid of these tricky scum marks. Apply oil to the clean faucet. Once the faucet shines again, rub some baby oil on it to ward off new spots and add a sparkling finish. Avoid scouring pads. Abrasive cleaning tools might work well on kitchen pans, but they should stay far away from your bathroom faucets. Because abrasive cleansers can damage and scratch the faucet’s finish, avoid them, using cloths and old toothbrushes instead. For brass faucets, dry and gentle is key. To get rid of spots and scum on brass faucets, stick to a damp cloth or a cloth dipped in warm, soapy water. Using anything more abrasive can damage the fixture. Likewise, once the faucet is clean, dry it thoroughly. You may even want to keep a cloth in the bathroom to regularly wipe the faucet after use, preventing new water stains from forming. To make your sink faucets beautiful, use the tips above to stay on track. Also, when you’re looking for new bathroom faucets, come to Modern Bathroom. We’re proud to offer a wide range of features and fixtures to outfit any style of bathroom.